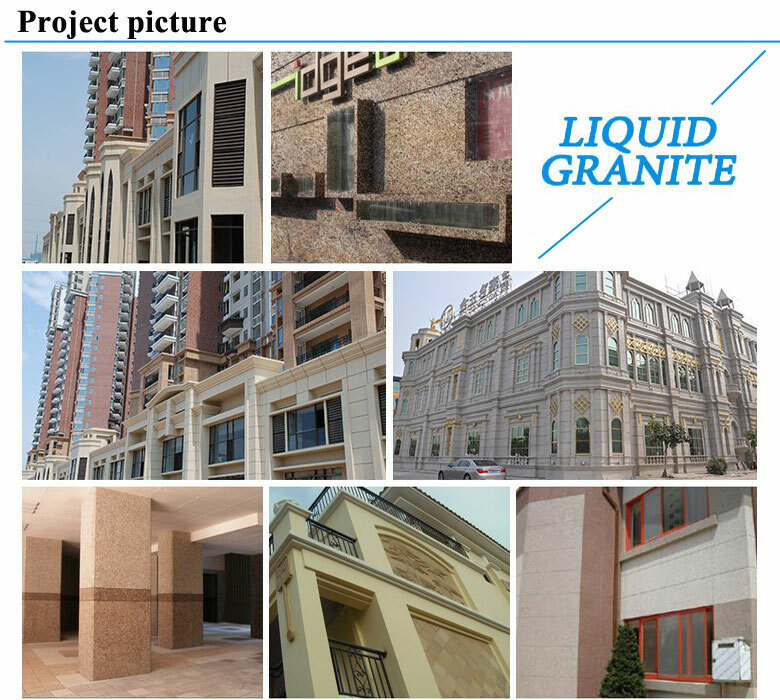 Faux Granite Paint resin emulsion as the base material, with different particle size of natural sand and composite rock tablets and a small amount of mica as aggregate, plus additives and water preparation. 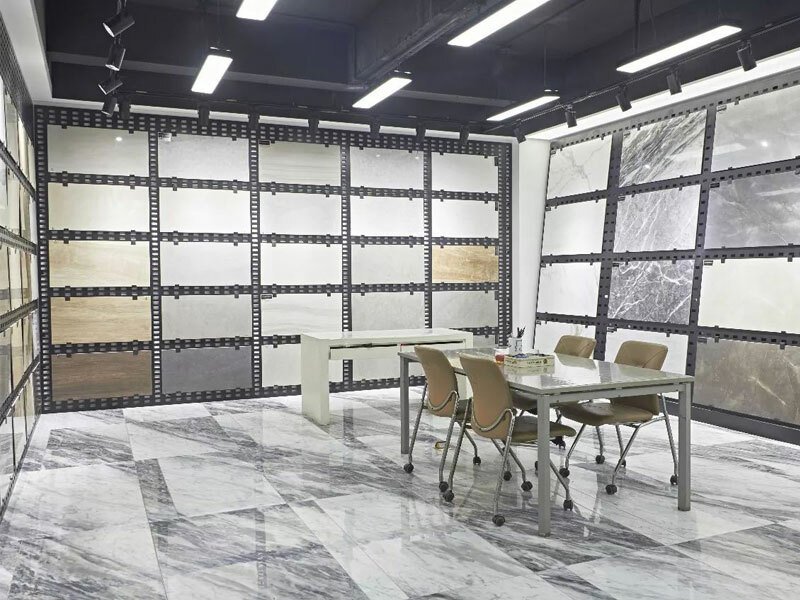 Faux Granite Paint for Concrete or cement inside and outside walls and brick walls, professional color engineers to ensure that different batches of products without color, Faux Granite Paint Colors rich matching, can be tailored. One gun can create more than 2 colors, it's 95% closed to the Natural Faux Granite Paint. It's water-basic, absolutely environmental, and no radiation hazard. Simple construction, varieties of color, one gun create more than 2 colors. 4) Spray special color primer of Liquid Granite. 6) Take the paste color tape away, after drying the wall surface, spray the special varnish. Reference dosage: 4-5m²/kg. 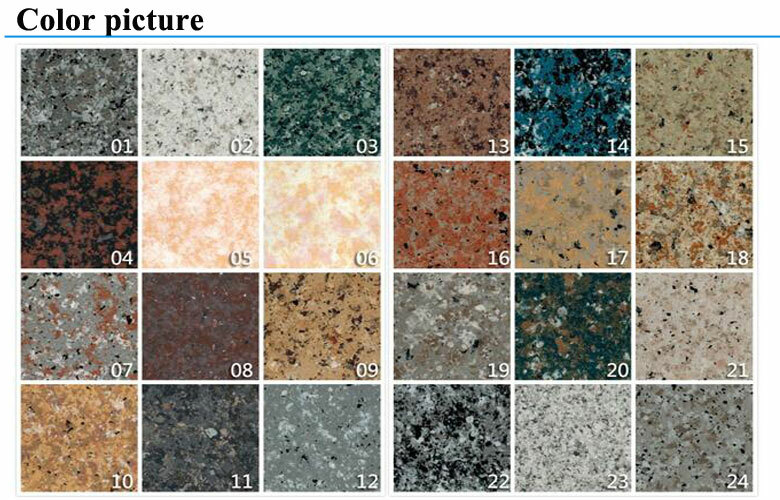 Material component: A: Colorful primer, B: Liquid granite main material. Accessory materials: Anti-alkali, shaped material (choose by customer), varnish. If choose by the powder mix with color in the packing, it can be constructed directly, no need to roll the colour. Note: Humidity should be above 85%, it can't be constructed under 4°C, the material shall be stored in the normal temperature. Q: Can you make different colors? A: Yes. Our color center has developed over 1000 kinds of colors, plz refer to our color card to pick up what you want. Q:can you accept the small order? 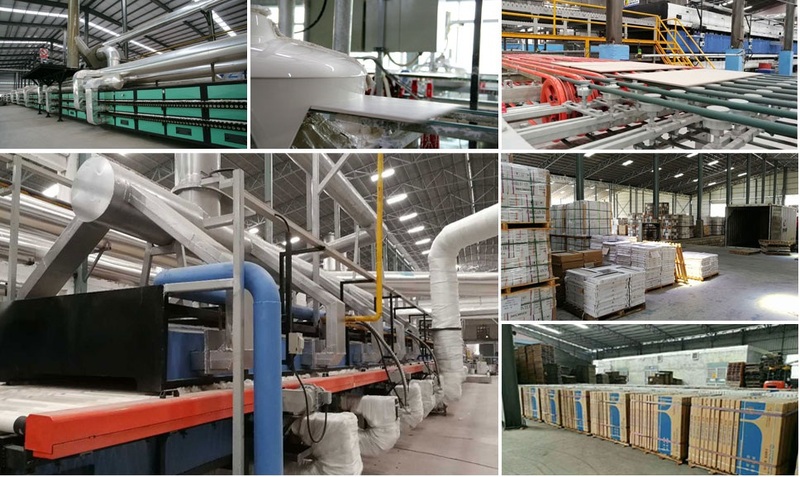 A:To be honest,it depend on the cost and technique,but we will try our best to accept the small order to build a long business relationship with our customers. A:We can accept various kinds of payment terms, such as L/C,T/T, Western Union, paypal ect. Q:Could i get samples for test? A:Yes,according to company policy,the sample will be free for customer,just need pay the freight. 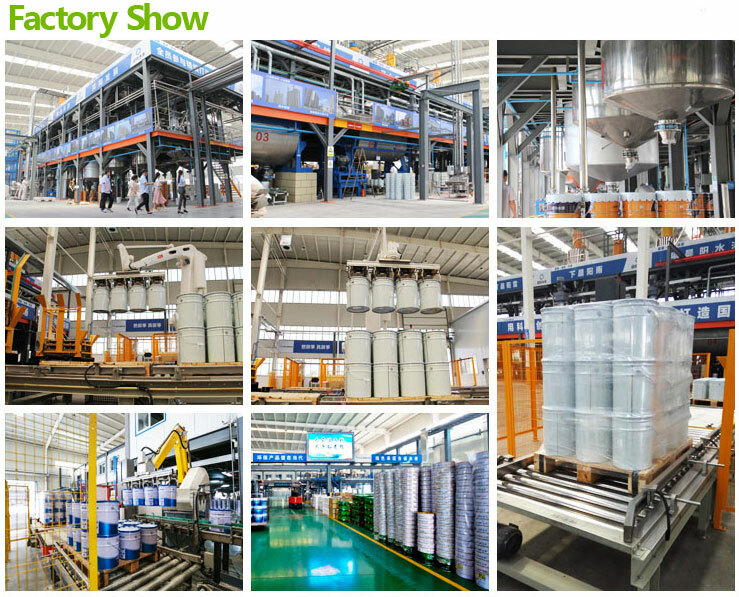 A:We are the coating manufacture,so we accept the M.O.Q 1Tons. A:It depends on the quantity.Generally speaking,it will take about 15 days after deposite received. If you need the goods urgently,we will make our efforts to shorten the delivery time.